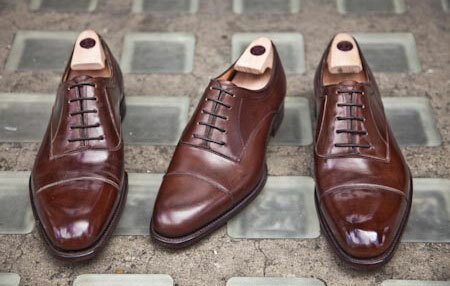 Polishing leather shoes up to a brilliant shine is an extremely enjoyable pastime. Nathan Brown over at Lodger always says that one of the problems with being an entrepreneur is that he never gets the time to sit down and polish his shoes any more. George Glasgow at Cleverley has complained to me of the same thing. Lodger’s store manager Clement has the opposite problem: he spends all his time polishing shoes but never his own, just the ones on Lodger’s shelves. Personally I like to spend a good half an hour over a pair while the wife is watching something atrocious on the telly. It is meditative, engaging and rewarding. I think it’s rewarding for two reasons. First, with no other piece of clothing does maintenance actually improve the item. It just puts brakes on a natural decline. Brushing your suit only returns it to the state it was that morning. The same with ironing a shirt or repairing a button. The best you can do is get back to zero. Polishing your shoes is more akin to wearing a canvassed suit and feeling it mould to your body, or indeed wearing in the upper of a shoe. Except that, with polishing, greater effort is rewarded with greater results. Not only is it a positive activity, it is one you can control. The second reason is the wonderful aesthetic experience. After you’ve applied the first layer of polish, and then returned with more polish and a touch of water, you can see each circle of your finger produce a swirl of brightness, getting more intense and reflective with each repetition. It is as if your fingers are coaxing out pure light. But don’t apply too much water. Just a dab of it the first time and only occasional top-ups later on. 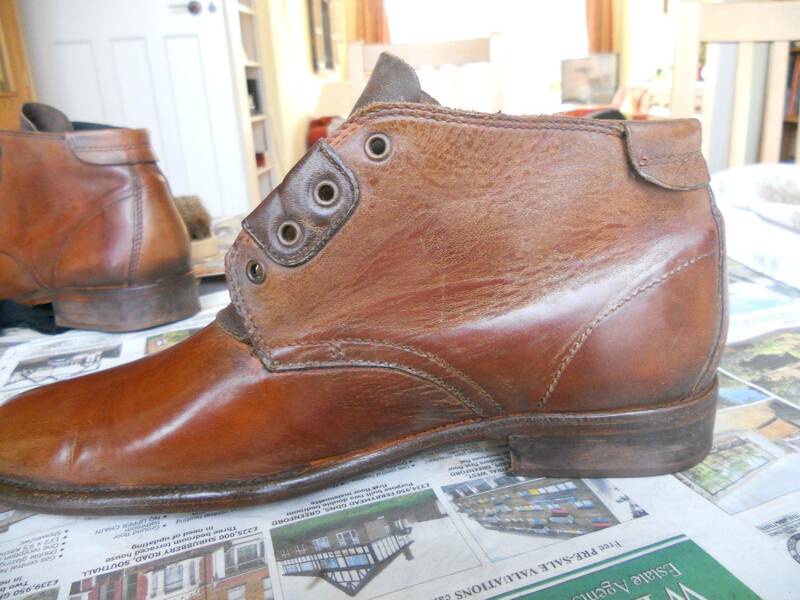 The cloth remains damp for a while, and too much water can soak into the leather and make it hard to carry on polishing. This is particularly true on thinner or more flexible sections, such as the bridge and instep. The toe and heel, being more rigid and reinforced by internal pieces of leather, can take a lot more. For each layer on the toe and heel (don’t do more than one layer elsewhere), carry on working in the polish until the surface is super-smooth, like glass. Until your little swirls make no perceptible difference to the surface. Then take a tiny bit more polish, and repeat. Don’t stop until you can tell the time on your watch in it. ‘Relocation relocation’ is on TV. I’m off to fetch my Cleverleys. You can follow the discussion on Don’t polish with too much water by entering your email address in the box below. You will then receive an email every time a new comment is added. These will also contain a link to a page where you can stop the alerts, and remove all of your related data from the site. I would appreciate a video walking me through polishing my shoes in this manner. I read this earlier and went home and started polishing some wingtips and touching up anything else that needed it. My 11 year old sat down to watch and went to get his “church shoes” (loafers) and started to touch them up. after being reminded to work on newspaper, not the table, he did a pretty good job. I will endeavour to make a video at some point. Not sure I agree with the wikihow entry, as there seems to be little difference expressed between toe/heel and the body of the shoe, despite them taking radically different types of wear. I also recommend, if you are going to use a spray, to do that onto the cloth not the shoe. Easier to control. I have suggested on gc that video of this could be good. David, that doesn’t sound strange and is common practice to finish off the toe of a shoe at the very end. But you need more water than that to crystalise the polish at earlier stages. Here is another link i find interesting. How about polishing brand new shoes? I didn’t know that the sides (in this case, of my boots) couldn’t take as much polish and water as the toe and heel; now they are haggared and roughened from 4 layers of polish and water too, while the toe and heel are fine. Is there anything I can do to save the leather there or have I destroyed them? Looks like it is done for. May try some saddle soap to nourish it. Or is may just be bad leather. They have an RRP of £120, not proper benchmade money by any means. Will try some saddle soap to clean out the excess polish. Thanks for all your help. Do you use mink oil at all? Why would not you use mink oil on calf and what would you recommend it for?